Traffic along George Crockett Road eastbound separates for Interstate 215 (Bruce Woodbury Beltway) immediately following Las Vegas Boulevard. Photo taken 07/06/2018. Interstate 215 makes up the southeast quadrant of the 51-mile Bruce Woodbury Beltway around Henderson and Las Vegas, connecting I-15 south of the Las Vegas Strip with I-515 north and I-11 south in Henderson. Extending 11.1 miles, the I-215 portion of the beltway provides direct access to McCarran International Airport (LAS), and also serves as a commuter route, shuffling local traffic between Henderson and the south reaches of the Las Vegas area. The Bruce Woodbury Beltway begins at a systems exchange with I-11 / I-515 (U.S. 93 & 95) and Nevada 564 in central Henderson, following the former footprint of Lake Mead Parkway before turning north toward LAS. Near the airport, the freeway curves west again ahead of its interchange with I-15 (Exits 12A&B) near the south end of the Las Vegas Strip. Though I-215 ends at the exchange with I-15, the Bruce Woodbury Beltway continues west and north around Las Vegas as Clark County Route 215, reconnecting with I-15 north of Nellis Air Force Base. AASHTO formally approved 18.9 miles of the I-215 designation April 17, 1993, between Tropicana Avenue (Nevada 593) near Spring Valley and I-515/U.S. 93 & 95 in Henderson, though signs only appear on the 11.1-mile stretch between I-15 and I-515. Completion of the initial stretch of I-215 in 1996 consisted of a short spur between I-15 and McCarran International Airport via the Nevada 171 connector and tunnel. Additional segments were built between 1996 and 1999, with the final mile between Gibson Road and I-515 being completed by 2005. The Las Vegas Strip skyline comes into view on the one mile approach to a high speed directional interchange with I-215 (Bruce Woodbury Beltway) and Nevada 564 (Lake Mead Parkway). I-215 travels along the portion of the Bruce Woodbury Beltway between I-11 / I-515 and I-15 at the Fish Bowl interchange, while Clark County Route 215 follows the remaining part of the 51-mile beltway. Photo taken 07/22/17. 8.2 miles in length, Nevada 564 follows Lake Mead Parkway easterly to the center of Henderson before turning northeasterly to the entrance of Lake Mead National Recreation Area. The easternmost portion of I-215 overlays a former segment of Lake Mead Parkway between the upcoming exchange and Nevada 146 (Exit 6). Photo taken 07/22/17. A double lane ramp funnels traffic from I-11 and U.S. 93 & 95 north to both I-215 west and SR 564 east. Photo taken 07/22/17. Lake Mead Parkway spurs 1.75 miles east to Nevada 582 (Boulder Highway) before heading northeast toward Lake Mead National Recreation Area and Lake Mead. Otherwise, I-215 heads west through western reaches of Henderson toward both McCarran International Airport (LAS) and the southern end of the Las Vegas Strip. Photo taken 07/22/17. Nevada 564 (Lake Mead Parkway) west ends ahead at the exchange with Interstates 11, 215 and 515. I-515 (Oran K. Gragson Freeway) is a 14.5-mile spur freeway that extends northwest from I-11 along side U.S. 93 & 95 from Henderson to Downtown Las Vegas. Photo taken 07/21/17. Motorists depart for I-515 and U.S. 93-95 north to Downtown Las Vegas as Interstate 215 begins its 11.1-mile course through the western reaches of Henderson. Photo taken 07/21/17. A loop ramp links I-215 west with I-11 south to Boulder City. The I-515 designation previously ended beyond Nevada State Drive (Exit 56) ahead of Railroad Pass while both U.S. 93 and 95 continued southeast toward Boulder City. I-11 replaced the southernmost portion of I-515 in 2018. The Bruce Woodbury Beltway carries I-215 westward to I-15 in southern Las Vegas before continuing as Clark County Route 215. Photo taken 07/21/17. Spanning Gibson Road (Exit 2), I-215 and the Bruce Woodbury Beltway enter the final half mile approach to its end at I-11, I-515 and U.S. 93 & 95. The 14.5-mile freeway extends northwest to central Las Vegas and I-15. I-11 begins and travels southeast toward Boulder City and the Hoover Dam area. Photo taken 07/22/17. Motorists pass by one final marker for I-215 as they begin to partition for the upcoming directional exchange with I-11 / I-515 and Nevada 564. Photo taken 07/22/17. Nevada 564 begins ahead and follows Lake Mead Parkway through Henderson on a northeast trajectory toward Lake Mead National Recreation Area. Otherwise, three lanes prepare to depart for Exit 1. Photo taken 07/22/17. I-215 officially ends as ramps separate for both I-515/U.S. 93 & 95 north and I-11/U.S. 93 & 95 south. Downtown Las Vegas is a 14-mile drive along I-515 north from this point while Boulder City lies 17.4 miles to the southeast via I-11 and U.S. 93 south. Photo taken 07/22/17. Previous scene along Interstate 515 north on its approach to then Nevada 146 (formerly Lake Mead Drive) prior to the completion of I-215 in 2005. SR 146 was truncated to its current location (Exit 6) while the portion east of I-515 was renumbered as Nevada 564 by 2003. Photo taken 11/11/00. Prior to its completion to I-515, I-215 east ended before an at-grade intersection with Gibson Road in Henderson. Once the Bruce Woodbury Beltway opened fully to the Oran K. Gragson Freeway, Nevada 146 (formerly Lake Mead Drive) was truncated to an end at I-215 and St. Rose Parkway. Photo taken by Jeff Royston (12/00). On the approach to Nevada 160 (Blue Diamond Road), Interstate 215 east and Clark County Route 215 west (Bruce Woodbury Freeway) along Interstate 15 north. A two lane ramp for all three highways depart in unison in 0.5 miles. I-215 and Clark County Route 215 make up the 51-mile Bruce Woodbury Beltway around the metro area, connecting I-15 with McCarran International Airport (LAS), Henderson (I-215) and Summerlin (CR 215). Photo taken 08/08/14. Traffic leaves for a collector/dirstributor roadway to Exit 33 (Nevada 160, I-215 and CR 215). Improvements in place by 2012 included this single egress point as well as other improvements to the SR 160 interchange. SR 160 west provides access to Red Rock Canyon National Conservation Area while Blue Diamond Road east connects directly with Las Vegas Boulevard. Photo taken 03/29/2015. SR 160 travels southwest along Blue Diamond Road through western reaches of the Las Vegas metro area enroute to Mountain Springs and Pahrump. Overall, the state road arcs west and north for an 80.3-mile course through Clark and Nye counties, meeting U.S. 95 midway between Indian Springs and Amargosa Valley. Motorists bound for I-215 and CR 215 proceed ahead. Photo taken 03/29/2015. Traffic from Blue Diamond Road will use a slip ramp ahead to rejoin I-15 north while the mainline ramp leaves for I-215 east and Clark County Route 215 west. I-215 travels 11.1 miles east to the city of Henderson and its end at I-515 and U.S. 93 & 95. Photo taken 03/29/2015. A Union Pacific rail line spans Interstate 15 on the half mile approach to Interstate 215. I-215 follows the Bruce Woodbury Beltway from I-15 east to its end at I-515 in Henderson. Photo taken 07/22/17. A collector-distributor roadway system provides traffic necessary connections between nearby Russell Road to both I-215 and Clark County Route 215, as well as I-15 south to Primm and Barstow. Photo taken 07/22/17. Passing under Sunset Road, drivers prepare to leave for Interstate 215 to McCarran International Airport (LAS) and Henderson. 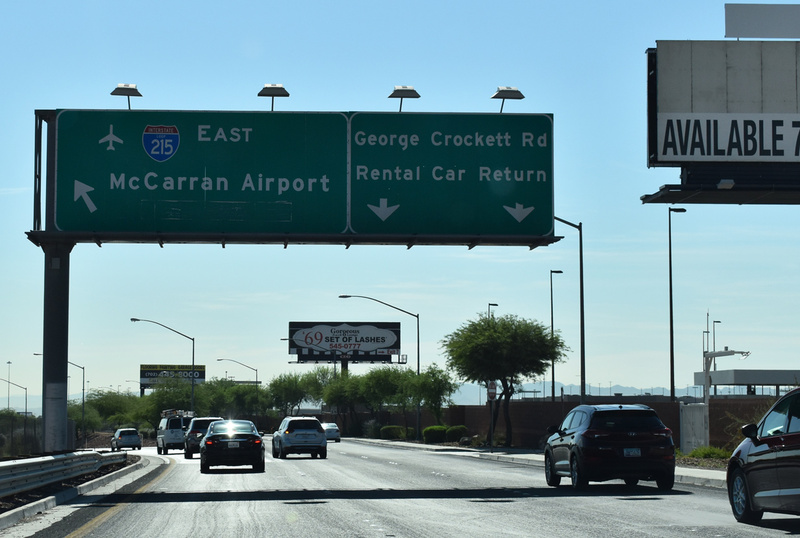 The ramp also provides motorists direct access to Las Vegas Boulevard and the McCarran Rent-A-Car Center. Photo taken 07/22/17. Interstate 215 west travels under Las Vegas Boulevard as traffic prepares to depart for Interstate 15 north. I-15 beelines north to the west side of the Las Vegas Strip toward the downtown area. Otherwise, a loop ramp departs for I-15 south to Barstow and the Los Angeles area ahead. Photo taken 07/21/17. Exit 12B leaves the freeway for I-15 south to California as motorists pass under the mainline. This also marks the end of I-215 west as Clark County Route 215 continues from this point forward along the Bruce Woodbury Beltway around Las Vegas. Photo taken 07/21/17. Clark County Route 15 transitions to Interstate 215 eastbound at the exchange with Interstate 15. Photo taken 07/21/14. Two lanes depart from CC 215 east for both I-15 south to California and Las Vegas Boulevard. The beltway mainline continues to the northbound ramp for I-15 and I-215 to McCarran International Airport (LAS). Photo taken 07/21/14. Prior sign assembly located at the end of I-215 west as it passed through the exchange with I-15 in south Las Vegas. At the time, the freeway portion extended a short distance west to Decatur Boulevard before diverging to frontage roads. Photo taken 11/11/00. Mr. Mojave. “Las Vegas Beltway Complete…sorta.” Online posting, misc.transport.road, November 27, 2003. Page updated June 11, 2018.